Description: British Hong Kong had a good story in the run-up to 1997. Its people worked hard and had an indomitable spirit. China had its own story about Hong Kong: after reunification, the city would prosper as never before due to China’s wise and pragmatic “one country, two systems” policy. Hong Kong people and the world bought those stories. But now it is clear that the British version of the Hong Kong story no longer holds while Hong Kong people are not so sure about themselves and their future seems less bright. The city and its people are stuck—they have no compelling narrative that joins the past and the future. 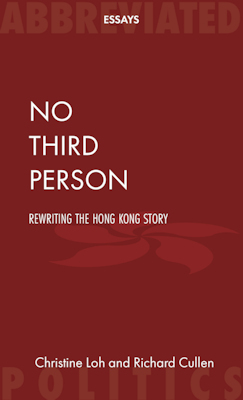 This book is based on our thoughts of what a new Hong Kong story might be: a story about “us” and “you”, the people who care about Hong Kong, not an impersonal “he/she/it” story—a story, moreover, to be worked out between Hong Kong and mainland China and no one else. About the Authors: Christine Loh Kung-wai has served Hong Kong in the public, NGO and educational sectors for more than three decades, most recently as Hong Kong Undersecretary for the Environment. Richard Cullen is a Visiting Professor in the Faculty of Law at the University of Hong Kong. Be sure to catch the book launch at the Foreign Correspondents Club where the authors will speak about their book at the Club Lunch on 18 October 2018. The book was featured in a SCMP article by Jeffie Lam on 1 October 2018. Loh and Cullen were interviewed by The Diplomat's Shannon Tiezzi for an article published on 10 November 2018. This book lacks intellectual tightness and acceptance of practical realities as well as (in consequence) moral rigour. 1. the authors treat China and the CCP as different, when in fact (as author Christine Loh knows very well, given her excellent analyses of the CCP and its role in HK)there is no to little light between them; furthermore, since President Xi came to power, the primacy of the Party, and within the Party of the Core leadership, and within the core leadership of the President, means that loyalty 'to China' becomes inextricably bound up with loyalty to one man and to his policies. The unavoidable moral implications are simply ignored. 2. The authors conflate HK and its citizens individually. What is undoubtedly true from an HKSAR perspective - that it is indivisibly part of China, and shares an inescapable common destiny with it, that will benefit from high mutual trust - is converted into the suggestion that we must all line up and swallow out principles, be we the CE, a leading academic, or a private citizen. It may be that reads too much into the call to unity, but where does the borderline lie between public and private? Are we allowed to have private disagreements with President Xi's view of what is good for China? At what point in the public-private divide (porous as it is) might any borderline lie? The authors do not get to grips with this difficult question (difficult on the basis of their postulates). 3. When they stray into analysis by example draw from the world outside China, they stray also from fair analysis. Their treatment of the Schenck case, decided in 1919 by the US Supreme Court, but referring to acts that took place in 1917, is used to suggest that the kinds of problems faced by China today have parallels with those that had in the past limited freedom of speech under the First Amendment in the USA. What is not recognised is that the US was actually at war in 1917, and the the lead judgment of Oliver Wendell-Holmes recognised that when free speech directly and immediately affected the ability of the nation to make war (in this case the action complained of was encouraging people to refuse to sign up for the army), then breach of the law forbidding actions that directly impacted the war-making effort (the espionage Act was the law concerned) could not be excused on First Amendment grounds. This is really too intellectually dishonest to be acceptable. One situation is obstructing the running of an actual war in wartime, the other is limiting freedom of speech when no immediate threat of any sort s objectively observable. The two situations are far from commensurate. I'd add that, having re-reviewed Schenck, it is even more obviously a poor example to use in connection with free speech in the context of HK/China. Not onlywas America at war at the time, but the documents that were treated as in breach of the Espionage Act were aimed at citizens who had already been accepted for the draft, i.e. it was an act directly aimed at the USA's then current war effort, and thus no more protected as free speech, said Mr Justice Holmes, than shouting 'Fire' in a crowded movie theatre. How debate on the possibility of HK independence remotely compares is beyond me. But Loh and Cullen obviously think differently. Not impressive morally, nor in terms of scholarship. And on top, the false comparison demeans the otherwise admissible argument that China must retain the right to proscribe certain behaviour, legally, and that it is in principle in HK's interest to show understanding and support for China (as a country, for sure). The point is not the principle, the point is where, in the real world, is the line to be drawn, and by whom. It is of course the sovereign right of China to declare whatever it likes is illegal, but there must be a limit to what citizens, academics, and even businessmen are obliged to accept in the name of 'loyalty'.